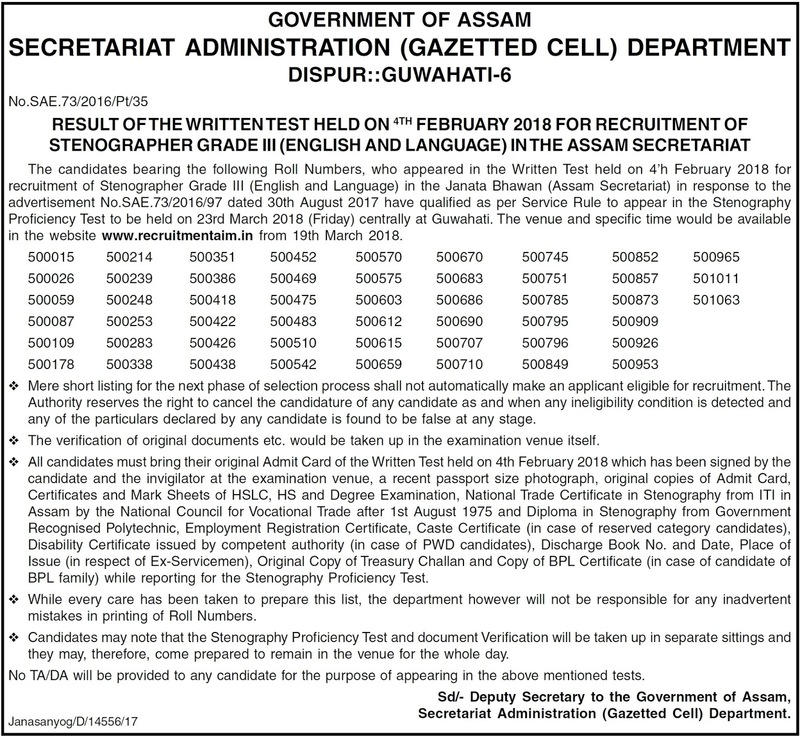 The candidates bearing the following Roll Numbers, who appeared in the Written Test held on 4th February, 2018 for recruitment of Stenographer Grade III (English and Language) in the Janata Bhawan (Assam Secretariat) in response to the advertisement No.SAE.73/2016/97 dated 30th August 2017 have qualified as per Service Rule to appear in the Stenography Proficiency Test to be held on 23rd March 2018 (Friday) centrally at Guwahati. The venue and specific time would be available in the website www.recruitmentaim.in from 19th March 2018. Mere short listing for the next phase of selection process shall not automatically make an applicant eligible for recruitment. The Authority reserves the right to cancel the candidature of any candidate as and when any ineligibility condition is detected and any of the particulars declared by any candidate is found to be false at any stage. All candidates must bring their original Admit Card of the Written Test held on 4th February 2018 which has been signed by the candidate and the invigilator at the examination venue, a recent passport size photograph, original copies of Admit Card, Certificates and Mark Sheets of HSLC, HS and Degree Examination, National Trade Certificate in Stenography from ITI in Assam by the National Council for Vocational Trade after 1st August 1975 and Diploma in Stenography from Government Recognised Polytechnic, Employment Registration Certificate, Caste Certificate (in case of reserved category candidates), Disability Certificate issued by competent authority (in case of PWD candidates), Discharge Book No. and Date, Place of Issue (in respect of Ex-Servicemen), Original Copy of Treasury Challan and Copy of BPL Certificate (in case of candidate of BPL family) while reporting for the Stenography Proficiency Test. Candidates may note that the Stenography Proficiency Test and document Verification will be taken up in separate sittings and they may, therefore, come prepared to remain in the venue for the whole day. Result Sheet: Click Here .